The Dirt Kings Late Model Tour brings high energy entertainment that captivates fans as drivers compete for the title of King, while battling side-by-side lap after lap. The Tour is the fastest growing dirt series in the Midwest. In the Tour's 2017 inaugural season, more than 23,000 fans packed their local dirt tracks to support their favorite driver and find out who is King. During the nine events of the 2017 season, the Tour visited eight different dirt tracks across the state of Wisconsin. 58 different drivers competed for the title of King and six succeeded, with an average of 28 cars per race. The Tour is active on social media outlets including Facebook, Twitter, Instagram and Snapchat, bringing the Dirt Kings Tour brand to new fans and reaching new markets. More than 1,000,000 fans interacted with the Tour on social media last year. In addition to social media and website reach, the Tour receives national media coverage from Dirt On Dirt, Circle Track Magazine, Speed 51, Hot Rod Magazine, and Dirt Late Model Magazine bringing tremendous brand recognition and exposure to the companies that partner with the Dirt Kings Tour. Growing up in Kansas City, Jason spent summer nights at the race track with his family. Family vacations would involve visiting tracks across the Midwest to watch racing. As soon as he was old enough, Jason joined a pit crew with his dad at a local track. In college, Jason worked for a team that raced the NASCAR Midwest Series. At his first NASCAR race in 2001, Jason met his future wife, Sandy, who worked for the series. Jason continued to travel with the team through college and upon graduation, moved to Freedom, Wisconsin, to be near Sandy. Jason switched from being a pit crew member to a tech inspector and worked for the NASCAR Midwest Series and began to help his future father-in-law, Bob Abitz, as a tech inspector at local race tracks in Wisconsin. Jason continued his work as a tech inspector after the NASCAR Midwest Tour closed, working with several other tracks in the state of Wisconsin, and what is now the ARCA Midwest Tour. Traveling the tour took him away from his daughter, so Jason focused on local racing at the end of 2008, and started his own graphic design business, focusing on motorsports photography. Jason started working with the FASTRAK dirt late models in 2009 and worked with area dirt tracks as a tech inspector. Jason also worked for the Wisconsin Dirt Late Model Association (WDLMA) and Lucky 7 Series as a tech inspector and race director. Jason is a certified licensed drone pilot and expanded his design photography business to include apparel design and race car graphics. At the end of the 2016 season, Jason knew the timing was right to start a new dirt late model series. "I'm still not sure how I convinced her that starting a series was a good idea. Sandy was perfectly happy staying at home with Katelynn while I was at the track. We both love racing and we wanted to build up dirt late model racing in Wisconsin." 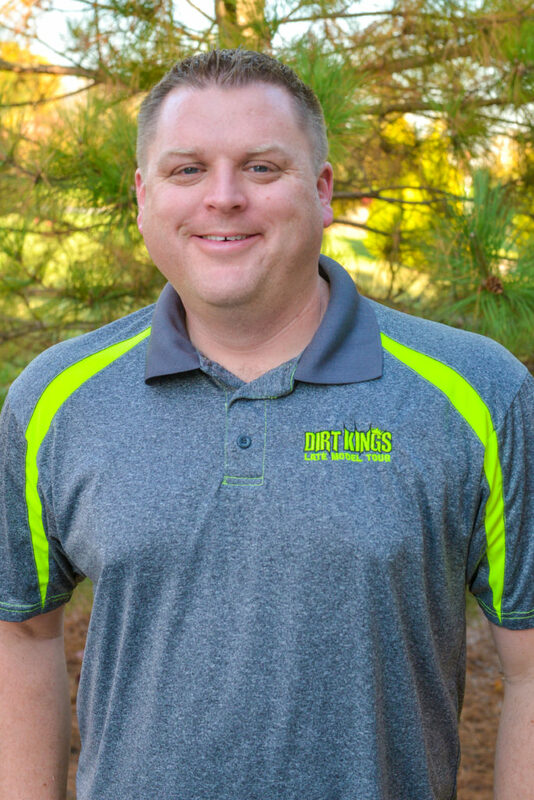 After discussion with the board of the WDLMA, Jason led the effort to found the Dirt Kings Tour and carry on the legacy of dirt late model racing in Wisconsin. Sandy has been involved in auto racing her whole life. As a young child, Sandy helped her dad, Bob Abitz, work on his race car, handing him wrenches and helping to change engines. Sandy worked selling concessions and souvenirs at the race track before she was old enough to be in the pit area. By age 12, Sandy had convinced her mom to let her travel with her Dad to the tracks on a weekly basis. Sandy worked three nights a week as a tech inspector with her dad at several tracks in Wisconsin. While in high school, Sandy started working in public relations, writing press releases and began writing a column in The Checkered Flag Racing News. In addition to working at the weekly tracks, she traveled the Midwest with the ARTGO Challenge Series (through 1997) and worked for the NASCAR Midwest Tour from 1998-2006. It was at a NASCAR Midwest Tour race in 2001, that Sandy met her future husband, Jason, who was working for a team from Kansas City, and the two married in 2004. After the NASCAR Midwest Tour ended, Sandy continued to be involved with auto racing, working mostly in public relations and took a short break from the track when she stayed home to care for their daughter, Katelynn. Sandy has worked as a tech inspector, scorer, in marketing and public relations, and day to day race operations for the past 25 years. 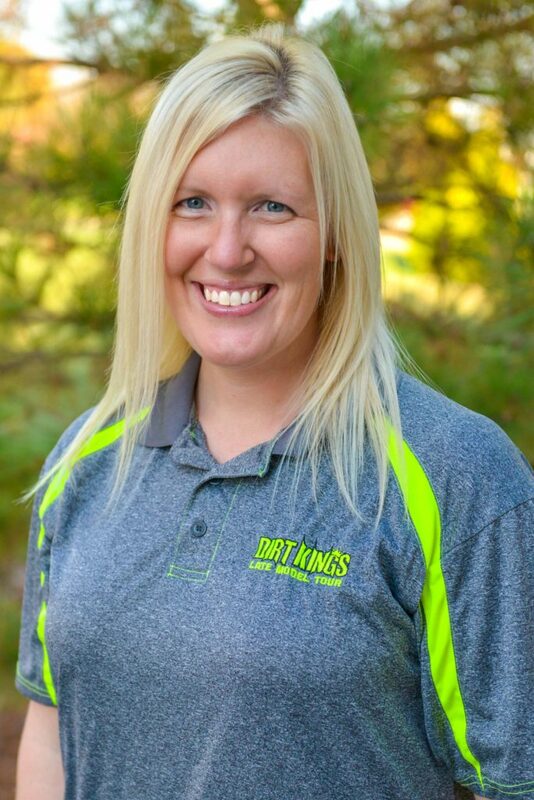 Sandy's diverse background as a tech inspector, scorer, working in marketing and public relations, and day to day race operations equipped her to be interested in starting the Dirt Kings Tour. Both Sandy, and her husband, Jason, saw an opportunity to create a dirt late model series that would complement the two weekly tracks at Shawano Speedway and Plymouth Dirt Track Racing, and bring in late models from across the Midwest. "It was our vision to build a dirt late model series that would feature competitive racing and create a following and community of fans for dirt late models. We intend to grow and expand our reach in 2018."